We’ve Got A New Trophy! Home – We’ve Got A New Trophy! An enormous thank you to Mike and Jacinta Stubbs from the Willetton Trophy Centre for very kindly donating our all new Mitch Gillam Cup trophy! It is certainly a major improvement on the previous edition, and for the first time features the logos of both clubs, Leeming Spartan Cricket Club and Bullcreek Leeming Football Club. Mike was on hand to present the trophy following Sunday’s match, seen below standing in between Bombers President Mike Petkovich and Spartan President Peter Coombs. Cheekily, we’ve already had it updated with our 2017 victory! Willetton Trophy Centre are proud sponsors of the Leeming Spartan Cricket Club in season 2016/17! Be sure to check out the Willetton Trophy Centre Facebook Page by clicking here. 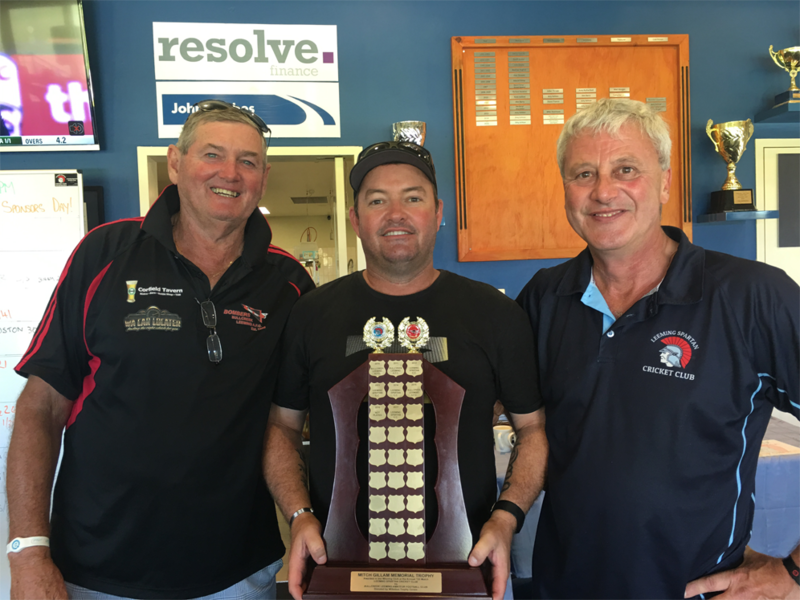 Bullcreek Leeming Football Club President Mike Petkovich, Mike Stubbs, and Leeming Spartan President Peter Coombs.